STUNNER: Read Elektor Magazine at a Rock-Bottom Price! 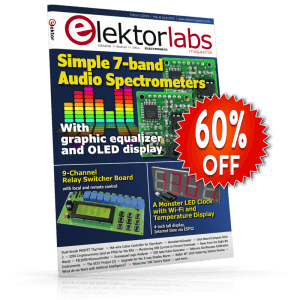 Read ElektorLabs Magazine at a Rock-Bottom Price! Every issue of ElektorLabs magazine is loaded with up-to-date news and views, real-world lab tests and high quality DIY construction projects. You can rely on ElektorLabs for solutions and insights to all your electronics challenges. Raspberry Pi, Arduino, ESP, IoT, Embedded Systems, 3D printing, PCB design and more. • 6 editions of ElektorLabs magazine (print and digital format) with exclusive access to 1000s of electronics projects and schematics. • Access to the Elektor Labs online platform, where you can collaborate 24/7 with other makers, as well as Elektor's in-house engineering team. Start bringing your products to market ASAP! • An Elektor web store discount so you can purchase the best electronics boards, kits, books, and tools. • Unrestricted access to the Elektor 1990 – present day archive. • Free access to all PDF editions of Elektor Industry magazine. * Excl. shipping charges outside USA, UK & Ireland. This offer is only valid for people who don't already have an Elektor Membership.